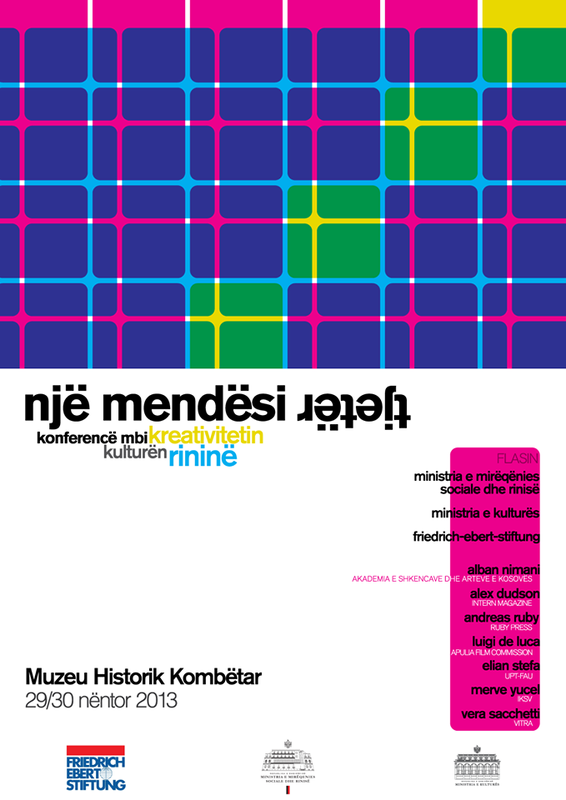 Another event worth attending (@National Historical Museum, Tirana) this weekend. Don't miss and don't forget to send notes, highlights, feedback, and questions our way. The conference on youth, culture, and creativity titled “A Different Mentality” is a two-day event that aims to create an initial spark that would (hopefully) become a dynamic process in the future. The conference, open to the public, welcomes all youth organizations, artists, architects, designers and activists to focus on and discuss culture and creativity as ways to influence social space and consequently empowering youth as active citizens.It is the first step for policy-makers, mass-media and civil society to recognize cultural and creative importance as a necessary dimension for social development and welfare. The event is organized by the Department of Youth Policy, Ministry of Culture, Friedrich Ebert Stiftung, UNDP. -On the importance of culture and creativity as strategic sectors in developing youth capacity and improving social conditions. -Ministry's strategy on cultural education of youth and IPA funding opportunities. -Foundation's view on the role culture and youth activism play and the specific importance in Albania. -On collaborations among youth organizations, galleries, art institutions and foundations in organizing joint cultural events with a social impact. -On working with youth in film and social issues. -On various disciplines that constitute creativity today and the opportunities to make different projects from these fields. -On the aesthetics of communist architectural heritage, artistic and pragmatic reuse of bunkers. -On the importance and nature of communication structures in artistic and cultural activities. -On the successful projects of IKSV and the importance of international cultural networks. -On creative fundraising for individual projects and the importance of unpaid or underpaid talents.